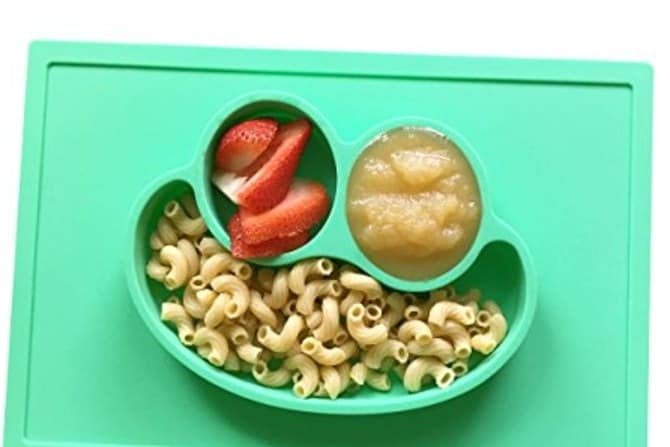 Inside this post: All-time favorite mealtime hacks for busy moms to save time, money and sanity. Use one or all of these mealtime hacks to make life easy when your patience is running razor thin. My husband is awesome in the kitchen. He loves to cook for our family on Saturday nights and he makes the best dinners! Our kids just eat it up. I always say he is the cook of the family. But last weekend when I commented at how good he was at it, he pointed something out to me. Saturdays are our fun meals. He gets to make something yummy, special, a little less healthy – of course everyone loves it. My job is to make food every day that is affordable, healthy, quick, easy, and tasty! Eek! Not a fair comparison, for sure! Not to mention, I’m suppose to do this with a baby on my hip, toddler under foot and managing the 5:00 pm power struggles and toddler meltdowns calmly. A while ago, I gave up on trying to do it all. Now I do what works. Here are some of my favorite mealtime hacks for busy moms! A dear friend with kids a season ahead of mine told me early on that TV can be a very helpful tool and that’s just what it has become for our family. At 5:00 pm, we come in from playing outside, the kids are starting to get tired and hungry and are on the verge of their witching hour meltdowns so I turn on a show for my preschooler and put the baby on my back in the carrier. That gives me thirty solid minutes to prep dinner and because we mostly limit TV outside of that time, my son is excited to sit down and watch instead of grumpily begging at my feet for a snack. Limit your meal prep to 30 minutes. 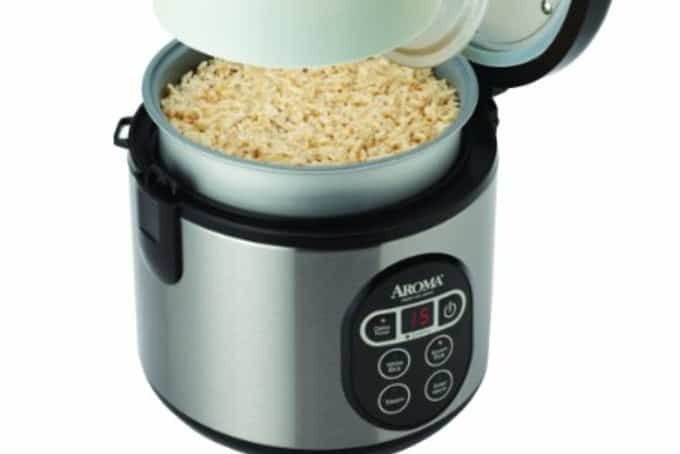 It makes the most delicious white and brown rice and I don’t have to sit by the stove waiting for the water to boil or the timer to go off. As soon as the rice is ready it just switches over to the keep warm setting and sits on my counter, ready for dinner whenever we are! Have a set meal list that you choose from. We’re foodies over here. We love to try new recipes, play around with family favorites, and make meals that take a couple hours of prep, but that just isn’t practical. I found myself begrudgingly suffering through meal prep trying out new recipes that took me way too long to make since I wasn’t familiar with it and my kids didn’t even like when I put it on their plates! So I stopped. New recipes are reserved for Saturday nights. Every other night, a list of healthy recipes I know I can make quickly, affordably, and I know the family loves! 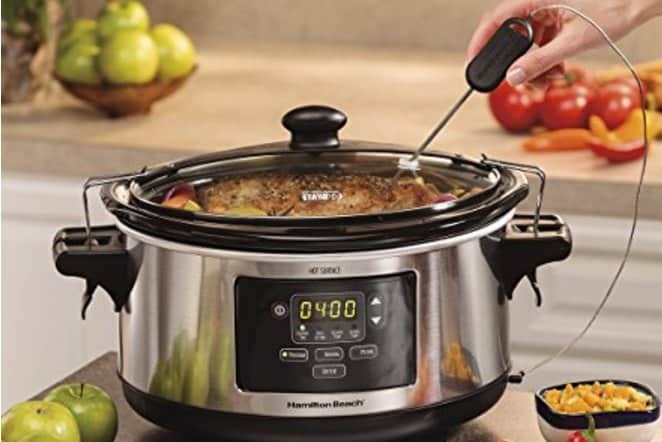 Convert your favorite recipes into crock pot recipes! And of course I use the age old, mama’s favorite: the crockpot. I love my crockpot! First, it highhandedly kept my family fed for the first four months of my second child’s life (love those freezer meals for the new-baby season!). But when I’m not in survival mode, I like the variety of our recipes from our meal list. So I started taking our favorite non-crockpot recipes and turning them into one! Just the other day, I took our family’s favorite New Orleans Gumbo recipe (which takes 3 hours to make!) and threw all the ingredients into the crockpot and you know what? It was delicious! Now one of our favorite meals can be a regular part of my meal plan! Make veggies easily accessible, visible and ready to use. One of the criteria for my dinner meals is healthy. We want to provide a balanced diet to our family which includes a lot of great, fresh veggies. I used to buy them and then find them half rotten in the back of my vegetable drawer. 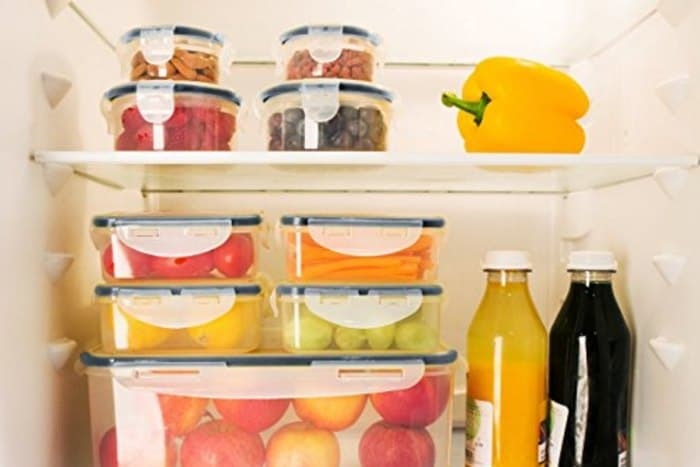 When I started using these convenient food storage containers, I noticed it was way easier to use fresh vegetables in our meals. If a recipe only calls for half of an onion or I only use part of a bell pepper, I’ll just throw the leftovers into one of these containers full of veggies. They make it so easy to see what I have available to use at lunch the next day or when prepping our next dinner! Make Enough for Two Nights. Okay, so this mealtime hack we use you’ll probably either love or hate, but we love it. Leftovers. Thursday nights my kids take a music class in the afternoons which puts us home just in time for dinner. So Thursday nights are leftover night. I plan for it Wednesday and make sure to prepare enough of Wednesday’s meal to simply reheat it and serve on Thursday (yep, the whole thing, veggies included). Can you believe I had never heard of these before? Don’t worry, my mom and both of my sisters now own their own too! Okay, my husband’s getting a lot of the credit, but he introduced me to this next hack too! The digital meat thermometer. This gem arrived at our house to be a handy tool my husband would use while perfecting his grilling, but now I’m certain I use it more than he does! I was so tired of wondering when meat was done enough or worrying that maybe it wasn’t cooked enough for our kids’ safety. Instead of ruining the taste by pulling the meat out of the oven and nuking it in the microwave, I started using this thermometer as a mealtime hack. I just put my meat (pork roast, pork loin, whole chicken, turkey) into the oven with this thermometer and when it registers the correct temperature I take it out. Not overdone. Not underdone. And man, does my family enjoy it so much more now that I can actually cook it well! The last challenge was always in the last minutes. The meal is made, everyone is washing up and sitting down at the table and I’m slowly trying to get everything on their plates, cut up into safe sizes. This always took me way longer than I thought it would. And then I watched my sister-in-law get her son’s plate ready. She did something I had never thought of! 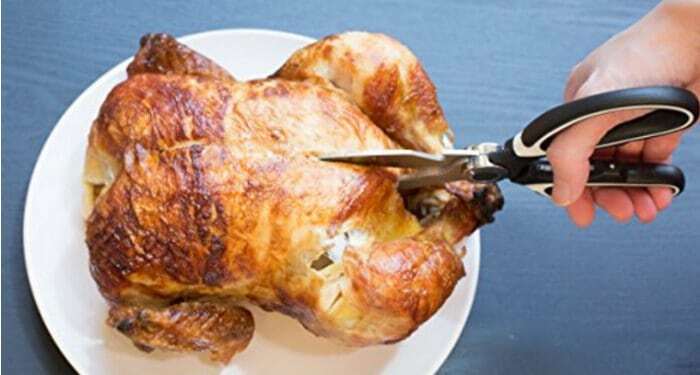 Okay, they are kitchen shears, but seriously it was an absolutely brilliant mealtime hack for busy moms. In less than half the time I was taking to cut up everyone’s food with my fork and knife she just snipped up all the food on the plate into bite-sized pieces! Most of us have shears already just sitting around in our kitchen that we use maybe while prepping the meat. They are so handy for young kids! After struggling through mealtimes with my oldest, I quit dinner time battles. You can read about that in detail over here. But one of the ways I did this was switching to these amazing placemats with built in plates. They suction to the table (or booster seat tray) so we were no longer cleaning up food off the floor from the plate that crashed to the floor. I love that they are dishwasher safe, so I can just stick them in with everything else to make cleanup easy! Use these printable mealtime routine cards to help your kids get ready for dinner without needing to nag or remind. 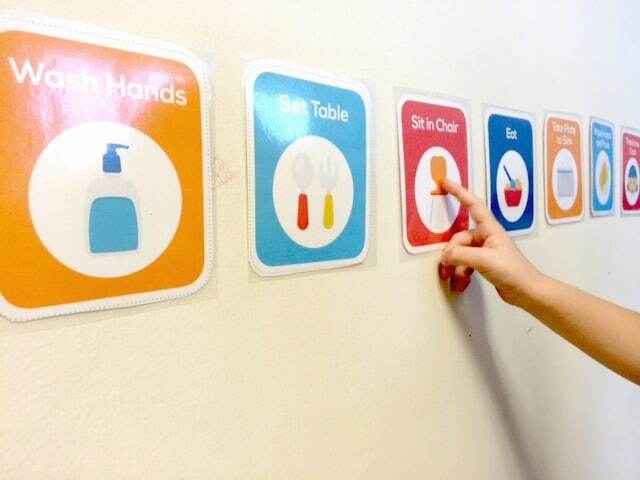 Your kids can learn how to prepare for dinner, sit through meals and clean up afterward following a simple visual routine. Plus, they’ll help you cut way down on power battles when your patience are most thin at the end of the day! So join me. Stop trying to conquer the world with your weeknight dinners. Try out some of these mealtime hacks and see if they help make your family’s evenings more enjoyable. And share with us! 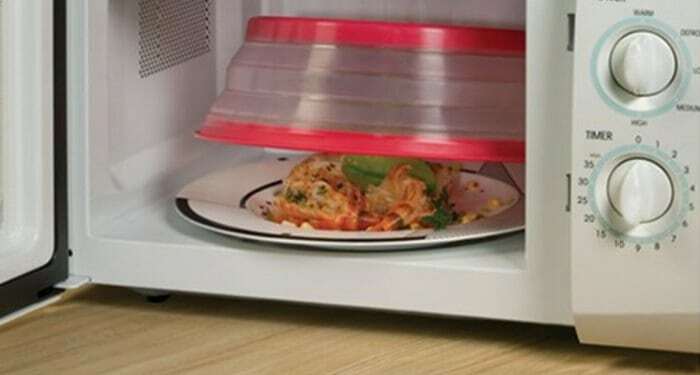 What are your favorite mealtime hacks that you use?